To Kindle or not to Kindle? That is the question. I have no quarrel with e-readers. Since I am a die-hard fan of learning, any medium that gets people reading is fine by me. Read on a papyrus scroll or an overhead projector or a Minority Report-esque glass screen, it makes no difference to me. But I have no plans to buy an e-reader. I don’t just love reading, you see. I love books. When I was in grade school, we lived for a time in a small, rectangular house where the ugly carpet was the exact color of rust. We didn’t own a television. When the weather was nice, I sometimes pedaled around the neighborhood on my bike, but most often I was curled up somewhere in our house, reading from a stack of books. I commandeered a corner of the living room, near a window, and dragged a pillow and a sleeping bag there. Lying on my stomach on the rough carpet, I read the hours away as specks of dust swam in the sunlight. I owned a precious few books, perhaps thirty, and I read these over and over. Others were checked out from the library – I read those over and over too. I was careful with books, never smashing the covers flat, never turning the corners down to mark my place. Every now and then a paper cover would tear slightly, at one of the outside edges, and I would scotch-tape the rip. I still have many of these books. The strips of tape are yellow and brittle now. To a shy girl whose family moved often, books were treasured companions, tangible comforts. I loved them as deeply as you could love a pet or a playmate. Then as now, their covers, their particular sizes conjured up the stories inside and the hours I’d spent with them. Some books were fat (I liked those best.) Some were tall and thin. Some had glossy covers, some plain. Some had unusual or pretty artwork on the outside. My handful of childhood books stayed with me through college and marriage and moving across the country and back again. Along the way, they were joined by lots of other books – more than a thousand by now. In many cases, looking at a particular book makes me think of the person I was shopping with at the time, or the loved one from whom it was a gift. In the late 70’s, my Dad’s sister occasionally came to visit us during the holidays. She seemed exotic, with her long hair and tall boots and her once-upon-a-time residence in France. Pretty and smart, she remained unmarried in her 30’s, which was not common then. She always came bearing gifts of books. She would read to us in the evenings, with a dulcet voice that broke off into a wonderfully throaty laugh. 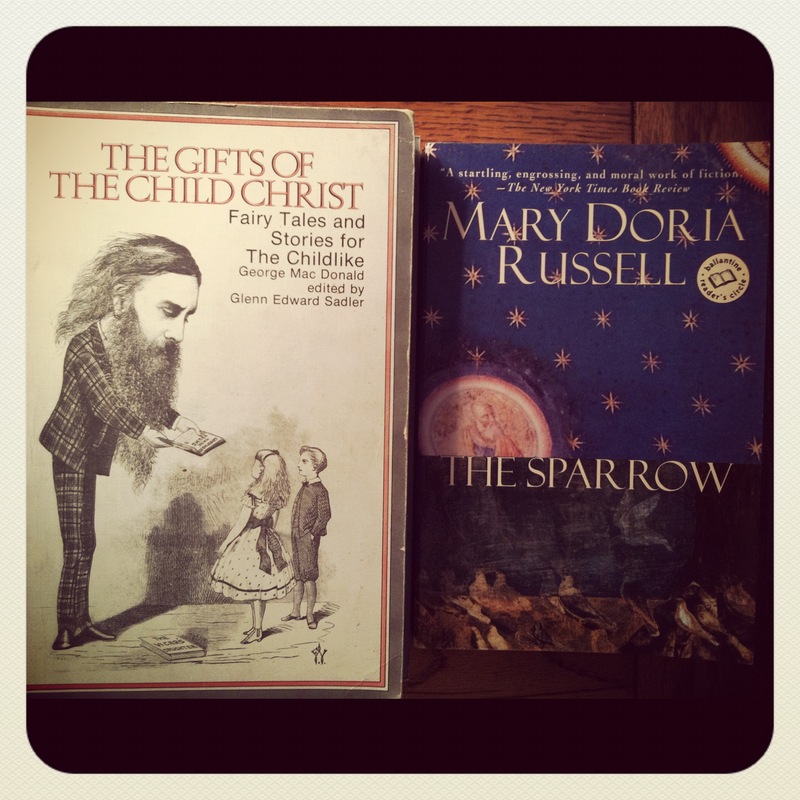 One year she brought The Gifts of the Child Christ, a two-book collection of the great George MacDonald’s fantasy stories for children. It would be impossible to guess how many hours I spent poring over those two books, over the next few years. I never picked them up, never looked at the familiar illustration on their gray-edged covers and felt their specific heft, without thinking of my aunt, and those hours by the fireplace. Those books sit three feet from me, now. Volume One has become delicate – the glue in the binding has failed a little. I keep them on a top shelf and away from my small children. But soon my boys will be old enough to understand these stories. They can snuggle up under my arm and carefully turn the pages, studying the woodcut illustrations at the beginning of each tale. They will be able to tell which ones were my favorites by how easily the pages fall open. While on vacation in the 1990’s, my best friend and I ducked into a bookstore. It was raining. After shaking out our umbrellas we wandered around looking at stacks of books, our wet shoes squeaking on the wooden floor. Susan had recently read a novel that she said I simply had to read. But I don’t like that genre, I said. When she couldn’t convince me, she insisted on buying a copy, and handed it over. (She was right. The Sparrow would become one of my favorite books.) My vivacious friend died three years ago, just before her fortieth birthday. As I write this, the book she pressed into my hand that night lays in my lap. Every time I look at it, I think of her. Books remind me of the places I bought them. From decades ago, I remember the barn-like Christian bookstore that carried Bibles and frightening tracts and the kid’s serial books that I loved. The store is still in business in my childhood hometown, and still smells like mildewed old pews. I remember the tiny bookstore in the fancy mall in Atlanta, where they kept the rare books locked behind a glass case. I bought my brother an early edition of Hansel & Gretel there. I remember the bookstore near the wharf in Baltimore, where I wandered in the evenings while on business trips. The store was in an old factory, with huge exposed pipes hanging overhead. When I’m adrift in a strange city, I seek out the nearest bookstore for comfort. Looking at books piled on tables and wedged onto shelves makes me feel like I’ve arrived home. I remember the bookstores in nearly every airport I’ve ever been in. I remember bookstores in strip malls, and in Victorian houses by the ocean. Nowadays most bookstores smell like roasting coffee (which always makes me want to unwind my scarf, even when I’m not wearing one). But I still sometimes pick up books and furtively sniff them, to get a whiff of that papery, inky, heavy smell that whispers, Oh, honey, just wait’ll you get me home. We’re going on an adventure. Granted, as with humans, a book’s essence is found inside it. I understand that. But people’s faces and voices and smells are evocative of all that we love about them. For me, it’s that way with books, too. I actually wrote the bulk of this post in 2010, then filed it away. A few months ago, I read this gorgeous piece by one of my favorite writers…and knew I wasn’t alone. If there is a book that evokes memories for you, I’d love to hear about it! America lost a national treasure on Thursday, when the brilliant writer William Gay died of heart failure at the age of 68. I’d never heard of Gay before I picked up the 2007 edition of The Best American Short Stories, which included his story “Where Will You Go When Your Skin Cannot Contain You?” From the first sentence (“The Jeepster couldn’t keep still.”), I was hooked. I’m a few days late (thanks to some looming writing deadlines, and all the media attention this week over my Grandma’s story), but here is the list of the books I finished in the last year, separated by the month in which I read them. I publish this list, really, in the hopes that others will follow suit (and if you do, please direct me there.) I love knowing what people are reading. In fact, when I see a photo of a home library in Architectural Digest, I always turn the magazine sideways and peer at the spines of the books, trying to see the titles. One of my favorite writers is celebrating the release of his second novel today – so naturally, I had to get in on the fun. If you’re unfamiliar with Billy Coffey, let’s fix that right now. Billy is a thirty-something writer from Virginia who keeps a blog called What I Learned Today. Ever since I discovered it last year, it’s been the one blog I would choose to take with me if I was going to be stranded on a desert island. (You know, if said island had electricity and wi-fi.) The posts consistently inspire me, soothe me, and remind me of things I didn’t know I’d forgotten. And also, Billy’s one of the finest writers I’ve ever read. I don’t mean “in the Christian world.” I mean, anywhere. In 2010, Billy turned his attention to fiction and published his first novel, Snow Day. 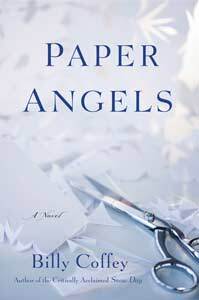 His second novel, Paper Angels, was just released today. I’d heard the term before, but had no idea what it meant. I’d certainly never read any. But bring up something I know nothing about, and it’s like waving a pound of catnip above a box of kittens. We need to talk about Alice Munro. Oh, how we need to talk about Alice. On most subjects, it is difficult for me to pin down my “favorite” thing: meal, drink, movie, color – there are just too many different categories, people. Who could possibly be so decisive? But when it comes to writing, I have no such difficulty. Of the thousand or so different authors I’ve read, for my money, Alice Munro is the best. Whenever Alice pens a new short story, it is snapped up by one of the most prestigious publications in the world. 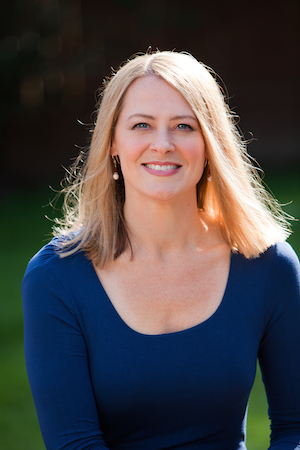 Her work is included in nearly every annual “Best of the Year” story collection. In 2009, she won the Man Booker International Prize (given for a lifetime body of work), only the third person to have done so. 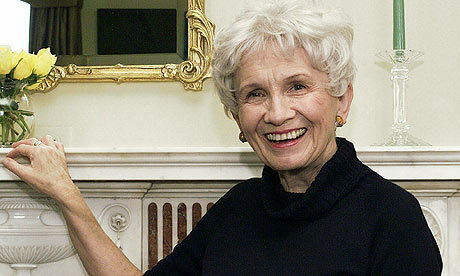 Yet Alice Munro is not a household name – and to serious readers, this is a serious affront. Can I at least describe what Alice does? I can try, but the problem there is, unless you are actually Alice herself, you don’t possess the literary talent to do her work justice. Quoting her directly is a better method of illustrating what she does. It is often noted that Alice’s short stories contain more depth than most full-length novels. Not only does she waste no paragraphs or sentences, she seems to waste no words. But her prose is not terse, like Hemingway’s; it is rich and full, it breathes and floats and is full of warmth. It’s also as sharp as a dagger. There are no zombies in Alice’s work, no explosions or natural disasters, no fantastic plots, very few murders. This is not how she keeps a reader turning the pages. Alice generally writes about simple people: housewives and grandparents and bewildered young women and children, in the most normal of settings: in cars, on farms, in retirement homes or back porches or shabby living rooms – but in the middle of this perfect ordinariness, she (as one reviewer put it) “flays” her characters, exposes their inner lives in ways that are shocking in the sense of recognition they stir in the reader. Even if you have never been in these situations yourself, you think, “Yes! Yes. That is exactly how it is.” Even if you have never met anyone like these characters, you believe that Alice has pegged them perfectly. Within a sentence or two, Alice gives you exactly enough information to completely understand how each character operates and what motivates them. This is in no way an easy skill. There are very few novelists who can do this, and none do it as well as Alice Munro. Who the freak writes like this?! Which nicely illustrates the difference between mediocre writers – or even good writers – and great ones. If you’ve ever wondered what the difference is between “literature” and every other kind of fiction, I believe that would be it. Average writers may have the ability to capture me with a story, but they do not write stunning sentences that put me on the metaphorical floor with their beauty. Alice Munro does this, to a greater degree than any other writer I’ve read. In fact, if I was going to be stranded on a deserted island, and could only have one work of fiction with me, I’d choose her Selected Stories. But, my dear fellow writers: if, while reading Alice’s best work (and Selected Stories or Runaway are excellent places to start – or shoot, check out her story “Dimension,” here), you do not at least recognize the level of skill she possesses, if you do not see the genius of what she’s doing – well then, in my opinion, you have some more work to do. Have you experienced the writings of Alice The Great? And which authors put you “on the floor” with their writing? So said my high-school-English-teacher brother, after a friend had recommended one of Simmons’ books to me. My brother was referring (I would soon find out) to Simmons’ writing abilities and to his raging intellect. Before encountering Simmons, the only science fiction books I’d ever read were The Sparrow (which is one of my all-time favorite books and sort of defies genres: you can read my post about it here) and Ender’s Game.